If you're looking for a great outfit for Halloween try this Headless Horseman costume! If you're looking for a great Halloween costume I have to say this Headless Horseman is definitely up there! And with the success of the television series "Sleepy Hollow" it's quite timely. It comes in lots of different sizes, so anyone can wear this costume. Well, I wouldn't recommend it for toddlers, but children in elementary school (if they're not too scared) could get one to fit. Note, the children's sizes seem to run small, so get one size larger. 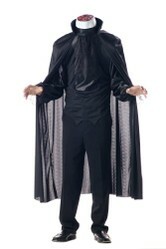 The costume consists of the cape, a black vest with sleeves. The vest has a black, lace ascot so it looks pretty cool. Of course the most important part is the head, or rather the head piece that shows he doesn't have a head! The shoulders are actually inflatable so the severed neck and shirt collar is high enough for your head to fit in. There are eye holes in the "headpiece" although it can be a bit difficult to align them to see well. Shoes and pants are not included, so just wear black. 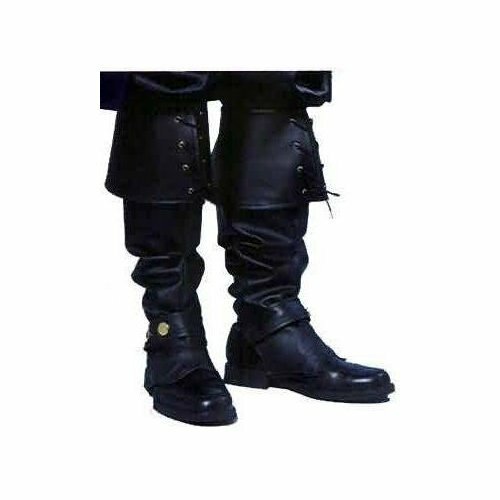 And get a pair of those boot tops below to look really cool, kind of like Ichabod Crane in "Sleepy Hollow"! To make this costume really great you need a few extra items. Try these for starters. In my opinion, this Headless Horseman really should be wearing boots not just regular black shoes! Shades of Ichabod Crane here. Anyway, I recommend getting these boot tops to put on top of your shoes to make this costume really great. Now, if you're planning to be really scary, you need to carry your head with you! This is a pretty gory sight! This is an artist's impression of the Headless Horseman - a bit on the scary side! Of course he is carrying a pumpkin carved into a Jack-o-lantern with a somewhat frightening face instead of his head. At least there's no blood! 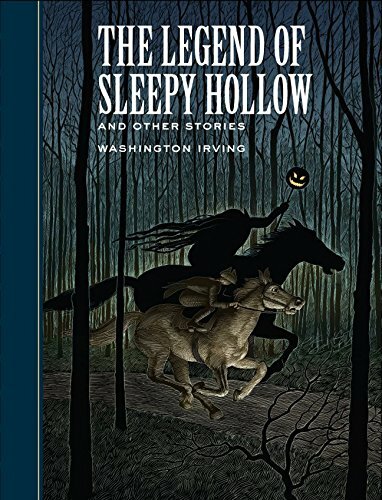 If you don't know anything about the Headless Horseman, the short story The Legend of Sleepy Hollow written by Washington Irving is really a must read. In this scary tale, a Hessian soldier during the Revolutionary War has his head shot off during a battle. The tale goes on to describe how a ghostly figure has been seen in Sleepy Hollow, riding his horse apparently searching for his lost head. A local schoolteacher named Ichabod Crane has the misfortune to encounter the apparition one night. And ... well you should read it for yourself! 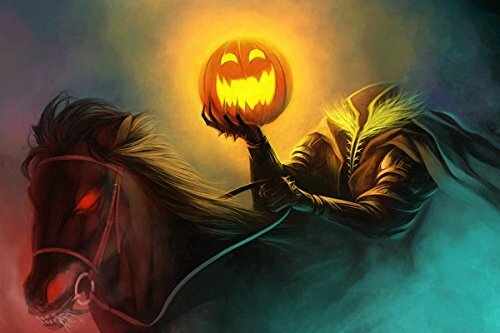 Are you ready to scare everyone with a Headless Horseman costume? Headless Horseman Hayrides and Haunted Houses in the Mid Hudson Valley is a truly spectacular (and scary!) Halloween attraction. Want a Scary Costume for Halloween - Try a Werewolf, Bigfoot, Troll, Minotaur, Medusa or Headless Horseman!